Harmonize the world with us! The chorus rehearses once each week on Monday evenings at 7:00 PM at First Presbyterian Church, 73 West Winter St., Delaware. Go in the back door and go up the steps, or take the elevator to the choir room; we would love to see you! Any Female who loves to sing is always welcome to visit us ANY MONDAY NIGHT. Our rehearsals normally are two hours long concluding about 9:00 pm. 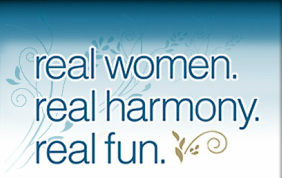 Come and visit us and experience the joy of singing harmony barbershop style. PUT SOME MUSIC BACK IN YOUR LIFE! If you love to sing and move to the music, we are looking for you! Consider this a personal invitation for you to come to our rehearsals and check us out. If your singing voice is high or low or somewhere in between, we have a part for you and would love to see you at a rehearsal ! No professional vocal training is necessary. You don't have to be able to read music. We provide a learning CD! It's a healthy hobby; singing is physically & emotionally good for you! Join an educational organization with events & opportunities available to you. Share your love of music with the barbershop family! Enjoy the fun and friendships of caring individuals! If you would like more information, please feel free to visit a rehearsal or CONTACT US!